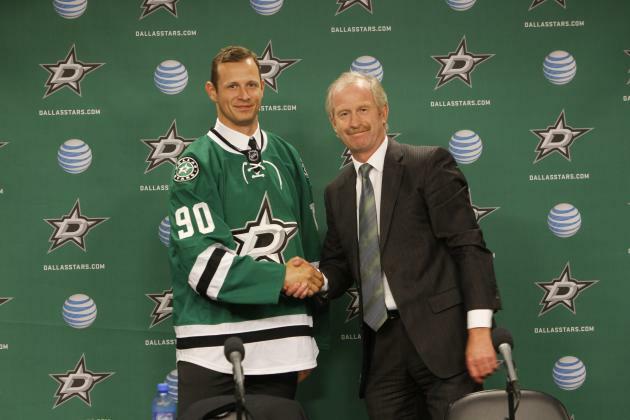 Has Jim Nill done enough to bring Dallas back to the top? While the St. Louis Blues are a team that could start hitting panic buttons if they don’t meet their goals, the Dallas Stars look like the most exciting team to follow in their journey towards relevance, let alone a Stanley Cup championship. Within the span of two years, General Manager Jim Nill has changed this team from an old team going stale, to a team that some of the best free agents and trade pieces want to play with. But that certainly wasn’t the case in the beginning of this decade. One has to wonder how the team got to where they are today. When Ken Hitchcock became the head coach of the franchise in 1996, Dallas joined a group of consistent Stanley Cup contenders with Detroit, New Jersey and Colorado every year and was seen as a place of stability. It was also a place where you were guaranteed to coach a Hall of Famer in Mike Madano and plenty of franchise stalwarts like Jere Lehtinen, Sergei Zubov, Darryl Sydor, Richard Matvichuk, Darien Hatcher and Jamie Langenbrunner. However, that all started to come to an end during the 2001-02 season when Dallas not only missed hitting 100 points in the standings, but also missed the playoffs for the first time in six seasons. Those same list of players were either hitting their late 20s or early 30s and a rebuild had to be taken place. With 32 games left to go that season, out went General Manager Bob Gainey and in went his assistant in Doug Armstrong. After that particular season was over, Armstrong would hire Dave Tippett and would refresh the team just enough to make five more consecutive playoff appearances, including a Conference Finals appearance during the 2007-08 season. Players like Brenden Morrow, Mike Ribeiro and Brad Richards were taking hold of the franchise, but the team no longer had the strength in defense like it did close to a decade ago when they won their Stanley Cup. That 1999 team had not only the best goals against in the NHL, but they were six goals away from giving up two goals or less per game that season (having Eddie Belfour as your goalie didn’t hurt either). In 2008, Zubov was still around, but he was the only player on that blue line that played over 1,000 career NHL games at the time. Stephane Robidas, Nicklas Grossman, Trevor Daley and Matt Niskanen made up a good chunk of that group in 2008, but none have hit that 1,000-game mark and/or have developed into the same quality in talent like Hatcher, Matvichuk, Sydor or even a Craig Ludwig did. Armstrong was gone the year before their Conference Finals run, but what would also be gone a year later was Dallas’ run as a consistent playoff performer. From Fall 2008 to Spring 2012, the Stars would go through two head coaching and two general manager regimes. That is a lot of turnover when you consider that Dallas had two general managers and three head coaches in fifteen years. Slowly but surely, any remains from the 1999 Stanley Cup Champions were left behind (including this emotional sendoff for Modano). What rebuilt the Dallas Stars was a plan that came mostly out of happenstance more so than an organized plan. When Armstrong was the General Manager, he was able to revamp the team with under-the-radar draft picks, but Niskanen was the only first round pick that worked out for him during his tenure. In short, it is extremely difficult to replicate what Detroit did in picking up players like Pavel Datsyuk, Johan Fransen, Nicklas Lidstrom and Henrik Zetterberg in the second half of the draft consistently. Since Armstrong is mortal like the rest of us, his drafting issues and not having a good chunk of his trades work out would cost him his job. When Les Jackson and Brett Hull came in to replace him in 2007, their first NHL draft did not contain one first round pick due to the Ladislav Nagy trade, but they ended up taking a franchise player in the fifth round. To this day, no one expects anyone coming out of the British Columbia Hockey League (BCHL) to turn into a superstar. Not only that, but scouts may not want to spend all that traveling time just to get on a ferry or plane to get to a town off the southern tip of Vancouver Island and watch the Victoria Grizzlies play, who were only an expansion team at the time. That’s why Jamie Benn never got any recognition to play in any of the league’s all-star games and when scouts did see him, they kept on harping one thing that convinced them he won’t make it: the dude can not skate to save his life. Red Line report did not even bother putting Benn among the top-300 prospects and left this little tidbit about his skating ability. “We’re not sure if he’s really that slow, or he just refuses to move”. That’s not what Stars scout Dennis Holland thought of him though. “Looking back, it was due to lack of leg strength. He was tough to get out of the blocks, his speed was just OK at the Tier II level. But once he had the puck you didn’t get it back from him, he made the right play every time.” Those positive qualities were enough to convince Stars management so much that they decided to give Benn a fourth round grade on their big board. Benn would go on to play for the Kelowna Rockets of the WHL and help them advance to the Memorial Cup in 2009, scoring 46 goals in 56 regular season games and putting up 33 points in 19 playoff games. He immediately joined the big club from training camp in 2009-10 and put up 41 points in 82 games. Only Patrick Kane has scored more goals or averaged more points per game than Benn among 2007 draftees. Two years later, new General Manager Joe Nieuwendyk took Alex Chiasson in the second round and Reilly Smith in the third round, but Nieuwendyk would suffer the same fate as his predecessors and not see his first round picks make immediate impacts. In 2013, Jim Nill came in from the Detroit Red Wings after being a front office assistant there for over 19 years. What made Nill different from previous GMs, however, was a bit of a high risk, high reward style to his management. He saw that you can only do so much in a draft, even when you have first round picks, that eventually you have to make big moves during the off-season. That was what he did when he hired long-time Buffalo Sabres head coach Lindy Ruff to coach the Stars to return them into Stanley Cup contention in the always tough Western Conference. He would then respond to Boston’s wishes and traded Reilly Smith and additional prospects for Tyler Seguin and Rich Peverley. At the time, Seguin was seen as a former number two overall pick with all the talent in the world if he can get his head on straight. From many across NHL higher-ups, it seemed like a big if. What Seguin brought, instead, was surprising leadership and the perfect teammate for Benn. That partnership was arguably the most beautiful to watch in the NHL last year and Seguin probably should have played for Team Canada in the 2014 Olympics. When the draft came around, Nill decided to use his first round pick on Valeri Nichushkin where Russians will always be undervalued in the draft because of “signability issues” and “lack of exposure to the North American-way of hockey”. What Nill received was one of the best teenagers in hockey and a possible winger to complete the first line with Benn and Seguin. This summer, Nill did it again by trading Chiasson, prospects and next year’s second round pick for Jason Spezza. Spezza was beginning to hit the tail end of his career, but he will now be seen as a needed second line center to replace another top-six forward in Peverley. To this day, we still don’t know if Peverley will come back to playing hockey again due to having corrective heart surgery after collapsing on the bench during a Stars-Blue Jackets game last March. Either way, having Spezza and bringing in Senators teammate Ales Hemsky was a good way to fill in such a void on the roster and give Peverley no pressure to let him decide on his future. The ultimate strength of Dallas may not be so much their recent acquisition of Star power (pun intended?) or their top line scoring, but the high possession numbers from their third line in Antoine Roussel, Cody Eakin and Ryan Garbutt. As a Caps fan, I still don’t know how I don’t go manically depressed every time I see Cody Eakin’s name on articles, because he has transformed himself into one of the best bottom six centers in the NHL after he was sent to Dallas in the Mike Ribeiro trade. What makes the rest of this line incredible is the fact that neither Garbutt or Roussel were drafted. Before he got his first professional contract in 2010, Garbutt had 17 points in 10 games ECHL’s Gwinnett Gladiators after putting up 50 points in 64 games for the CHL’s Corpus Christi Iceray’s the season before. Dallas would go on to sign him the season after when he produced 37 points in 65 games for the Chicago Wolves and Garbutt would play 20 games in the big club after that contract. Meanwhile, Roussel would spend four years at the QMJHL with Chicoutimi, where he would get almost two penalty minutes per game while putting up less than half-a-point per game. In his two years afterwards, Roussel would score only five goals and 18 points in 108 AHL and ECHL games with 272 penalty minutes for the Providence Bruins, Reading Royals and Chicago Wolves. Dallas would give him a contract in 2012 and his scoring dramatically improved the next season. Like Garbutt, Roussel played for the Stars in his first season by playing 39 of the 48 games in the 2012-13 season. You would think that having such heavy hitters like Garbutt and Roussel would be frowned upon in this day in age of modern NHL thinking, but that is not the case. According to stats.hockeyanalysis.com, Roussel played 39.5% of his even strength minutes with Eakin and produced a 55.3% corsi while on the ice together. Add the fact that the Eakin-Garbutt partnership produced a 51.5% corsi and the Garbutt-Roussel partnership produced a 53.2% corsi and you have the best third line in hockey, according to advanced stats. Now, Garbutt and Roussel are starting contracts that will give them a $1.8 million and $2 million cap hit respectively. Eventually, Eakin will put an end to his restricted free agency and see his extension hit the same tier. So in other words, you can have a world class third line that could be less than $1 million more than Shawn Horcoff. Speaking of Shawn Horcoff, he is on this roster!!! It hasn’t come up roses all the time for Jim Nill all the time. While Tyler Seguin was a great acquisition last year, the 35-year old Horcoff hasn’t been so good and is expected to be demoted to the fourth line with Vernon Fiddler and Colton Sceviour. Along with 34-year old Erik Cole, who was acquired in a trade from Montreal in 2012, and Sergei Gonchar, who was signed on a two-year deal last summer, the aging veterans look like they are decaying faster than they were expected to. For Cole, he has to find a way to produce on the second line with Spezza or Hemsky or else Dallas might need to get at least one top six forward at the trade deadline. That number could increase to two if Hemsky leaves his production behind in Ottawa and suffer from the same number of injuries that he had in his days in Edmonton. For the blue line, it took quite a while for this group to gel throughout last season. The 40-year old Gonchar would only score two goals and 22 points in 76 games last year and would have the worst corsi among returning defenseman at 48.8%. Aaron Rome and Kevin Connauton would combine for 61 games played after Robidas missed the majority of the season to a broken right leg and despite Connauton coming back, he is not supposed to get any playing time this year. Gonchar is expected to partner rookie Jamie Oleksiak on the third pair after playing the majority of his minutes with Cannauton last year. The rest of the pairings will have to be formed correctly as Alex Goligoski, Trevor Daley, Jordie Benn and Brandon Dillon found a way to have solid seasons. Personally, a Dillon-Goligoski would be their best top-pairing (both played over 17 minutes of even strength per game and has a 53.3% corsi when together) with Daley and Benn on the second pairing. Lastly, Kari Lehtonen might be one of the best kept secrets in the NHL goalie fraternity. Now Lehtonen certainly has reasons to make people a bit too squeamish to rely on him. He has missed plenty of playing time (usually due to his lower back and groin), especially while with the Atlanta Thrashers whom drafted him second overall in the 2002 draft. His playoff numbers are certainly not something to write about (only saving 87.4% in eight career playoff games) and he has a long-term contract in an era where giving such a contract to any goalie makes fans and management shiver in fear. However, since becoming a Star, Lehtonen has been an above average goaltender and in the same class as Carey Price, Jimmy Howard and Tim Thomas during that span. Even with all the injuries, Lehtonen needs to play 55 times this season to become the 63rd player in NHL history to hit 500 career games. If that is, at least, not a dependable goalie in a salary cap NHL, I don’t know how you can do better. Despite their AHL championship last year, the Stars will miss their head coach in Willie Desjardins and only Brett Ritchie and Curtis McKenzie seem to be players that could make any significant contribution to the NHL team if injuries are to occur. Recent first round picks Jason Dickinson and Julius Honka could make a name for themselves at training camp, but none seem to be physically ready to make the club and won’t be seen at the AHL until, at least, next season. The Stars will also have somewhere in the neighborhood of $3 million in cap space assuming Eakin’s extension gets to the $2-$3 million per year range. Even though Dallas could use an extra forward, I would go after a defenseman at the trade deadline where the depth of 2015 free agents is significantly bigger; so much so that someone like Cody Franson could be the biggest target considering that Toronto is so incompetent at knowing their talent and that Franson’s contract is so cheap for such a young and viable trade piece. Players like Marc Methot and Andrej Sekera can also fit this criteria of bargain hunting. Either way, the Stars have the assets and the pieces to, at least, make the Central Division the toughest in the NHL. Can they give Chicago a run for their money? Maybe not, but at least the Stars are not going to go quietly. If anything, their headlines will bring them plenty of noise. ← Has St. Louis done enough to surpass the Kings and Blackhawks?